Let’s get real – humans are materialistic. Which other species will pin a lofty price tag to a piece of compressed carbon anyway? For that matter, why does Beyoncé’s mantra of “putting a ring on it” denote everlasting love? There’s just something so hypnotic about priceless gems that all rational thought is thrown out of the window when in the presence of diamonds. 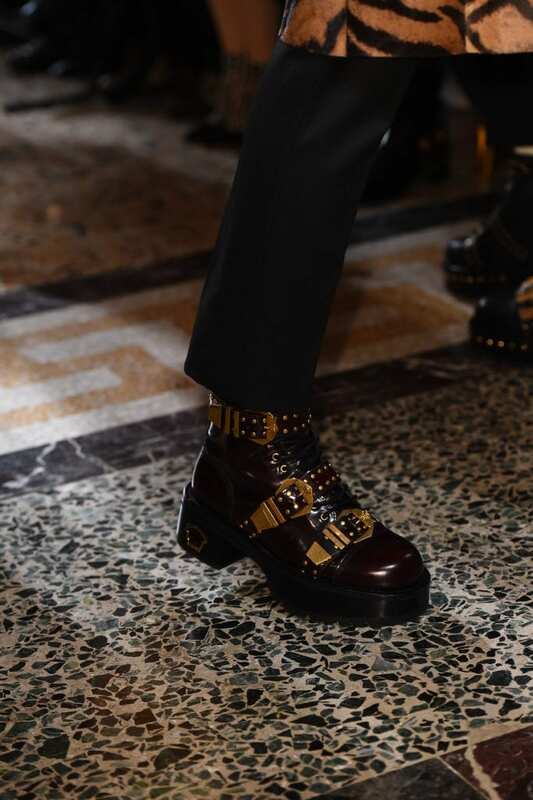 This is for the kleptomaniacs: Fall/Winter’18 blinged-out kicks to make a conspicuous entrance. 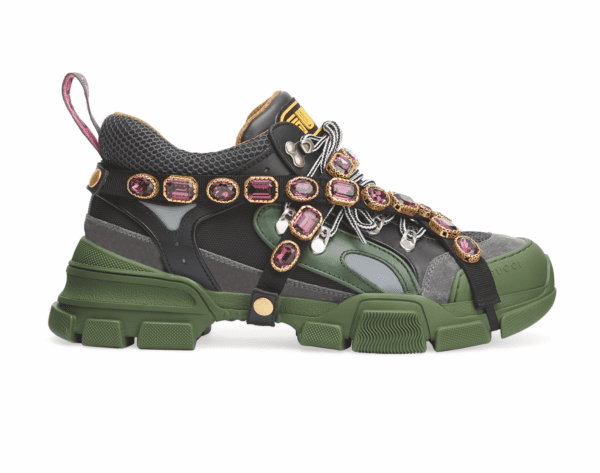 Gucci decided to up the ante in the chunky sneaker wave with their Flashtrek sneaker, this time embellished with wraparound elastic straps of fancy-looking crystals. Inspired by the hiking world, if the oversized stature of the sneaker did not already turn heads, then the kaleidoscopic crystals surely will. 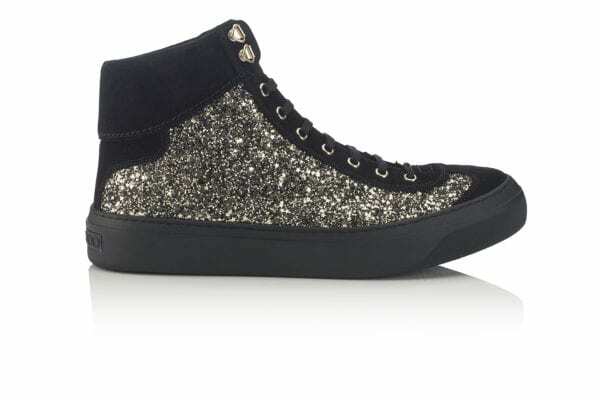 Jimmy Choo’s star-spangled hi-tops are the way to go if one is out to make a flashy statement. The shoes’s body is sprinkled with dazzling sequin-like glitter and is made of 100% calf leather so the wearer can saunter around in comfort while the shoe shimmers in the camera flashes on the red carpet. The Parisian Maison has been synonymous with embellishing sneakers extravagantly and their pair of boat shoes from the season is surely a testament to that. Louboutin’s trademark studs adorn the shoe along with complementing eyelets, just make sure nobody steps on them barefooted – for the shoe’s sake. 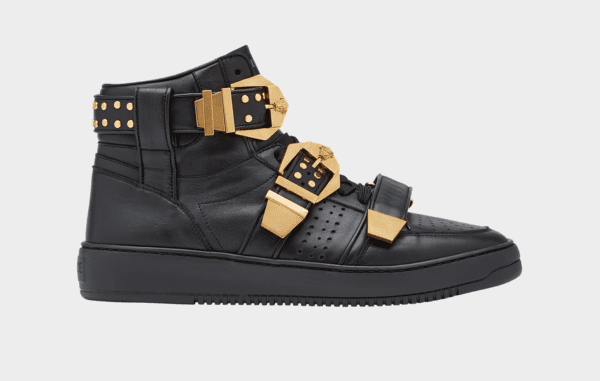 The colour gold has always been Versace’s calling card, it pants most of the Maison’s signature motif and here it is once again, gracing the buckles, studs and straps of these new hi-top sneakers. The many lustrous fasteners and belt buckles make for splendid details showcasing the house’s attention to detail and the gold coating on the silverware is icing on the cake, exuding a sense of exquisite luxury. Gucci's Spring/Sumer'19 1970s-inspired wardrobe calls out to party animals through the ages, from dusk till dawn. It's barely noticeable in sunny Singapore but the season of spring officially begins this week. Elsewhere in the world, the greene ..